As the NBA players were enjoying their All-Star break, NBA stat-heads gathered in Boston for the 12th annual "Dorkapalooza". I convinced RotoWire to send me, with the following charge: be the eyes and ears of the Fantasy community. The Sloan Sports Analytics Conference, often referred to simply as "Sloan" (borrowing the name from the MIT Business School, with which the conference is affiliated), isn't just about the NBA. Though the conference was co-founded and is co-chaired by Rockets GM Daryl Morey, the conference covers all sports, including track, crew, and e-sports. The NBA and the NFL dominate the conference, but it welcomes all kinds. This wide focus was a double-edged sword – on the one hand, the conference was spread too thin to spend much time talking directly about Fantasy. On the other hand, the lack of straightforward this is the panel where we talk about Fantasy sports made it all the more important that we sent an ambassador to look for helpful takeaways. While there wasn't much to provide immediate fantasy help, there were many discussions that will have dramatic impacts on the future of Fantasy. Two areas in particular stood out: analytics-based approaches to player health (both recovery and maintenance) and future changes to NBA rules. A big focus of the conference was using data and technology to improve player health. Most of the focus was on injury recovery, but keeping already healthy players healthy (and helping them get healthier) was also a major theme. Another subtle theme throughout the conference was that teams are increasingly working with their athletes to improve nutrition. One panelist noted that in the modern NBA, almost all teams provide at least two meals per day, whereas 10 years ago most teams simply put out a breakfast spread. Teams are paying a lot more attention to nutrition, working with players and nutritionists to develop diets that will help the players perform. Teams are also shifting toward incorporating new data and technology into training programs. While the state of medical science is always improving and advancing, more of the growth is in training technologies. Some of the advancements are in the development of new products. The conference featured several startups, which developed tools that would either avoid injury or help players recover. For example, one company developed a series of sensors that would be worn on different parts of the body and provide real-time movement tracking. These sensors can (mildly) zap the athletes if their form worsens over the course of practice or exercise. Not only would the player avoid potentially injurious movements, but the tracking data would allow the team and the player to work together on a training regimen build specifically to target the muscles that first showed signs of fatigue. There were several startups offering products that differed in the specifics, but that aimed to achieve the same bottom line: track exercise as accurately as possible, identify potential problems before they become serious injuries or setbacks, and provide the information to enable individualized training or recovery programs that maximize recovery time and the probability of success. This movement toward individualized health – for nutrition, for training, and for recovery – was the major theme connecting almost everything in this arena. But there was a big but attached to everything. More and more data and technologies are available and becoming available to help teams better manage the health of their players. But not all teams are open to the information and willing to incorporate it into their own practices. This is where the Fantasy potential is huge. As smart teams race ahead, less-smart teams will fall further and further behind when it comes to health management. Some teams will likely find ways to consistently cut down recovery time or rates of reinjury. Other teams will keep playing every starter 34 minutes a night, every single night. It won't work every season, and it won't work with every player, but over the long term Fantasy managers who target players on the teams incorporating these new advances will get more games out of their roster than managers who don't. At least that's the goal. Teams embracing new data-based strategies in other fields correlate with teams that embrace new data-based strategies in health (he was careful to point out that the correlation was not perfect). Frequent turnover in management usually means a team is less likely to have invested in the latest health science. Pay attention to teams that rest players and manage minutes (he didn't specify, but the clear implication was the Spurs) versus teams that do the opposite (again he didn't specify, but the clear implication was the Timberwolves). During the summer of 2016, the NBA made changes to the "hack-a-Shaq" rule. The changes aimed to minimize the frequency of teams slowing down the game by fouling poor free throw shooters. The change had an immediate impact on Fantasy basketball. In 2015-16, Fantasy's three worst free-throw shooters – Dwight Howard, Andre Drummond, and DeAndre Jordan – averaged a combined 21.9 free-throw attempts per game. The next season, after the alteration to the rules, the trio's attempts dropped to a combined 15.3 per game, while maintaining their status as the three worst free throw shooters in the game. Over the course of one offseason, a single rule change altered the entire Fantasy landscape. Under the old rules, owning one of the three required punting Free Throws – it was mathematically impossible to overcome their damage without owning multiple players who had first-round Average Draft Positions (ADP). After the rule change, however, those three players were only marginally worse than a half-dozen other impact bigs: Rudy Gobert, Hassan Whiteside, Clint Capela, and several more. Recovering from the unholy trinity was now possible. Those who noticed and adapted quickly obtained a massive advantage over their competitors. The NBA is always tweaking its rules, trying to create the best possible product. Fantasy managers should attempt to track these changes and anticipate their impact (or at least keep reading my articles, as I'll try to do this for you). Several rule changes are under consideration at all times, and some would impact Fantasy more than others. Here's a quick glimpse at some potential rule changes discussed at the conference. All of these have been proposed by Very Important People, and so all have at least some chance of happening (admittedly, that chance is low for many of these). Changes are listed in approximate order of likelihood that they actually take place. Tanking reform: The NBA just tinkered with its lottery odds in a noble yet misguided attempt to discourage tanking. The new rule hasn't taken effect yet, but no one expects it to solve the problem (and I think it will actually create new problems). Further tanking reform in the future is all but certain. Since adding the right player from a tanking team is often the final difference-maker in Fantasy leagues, whatever changes happen here will impact Fantasy. Different changes would have different impacts (shocking, I know). A big thing to watch out for: if fewer teams tank, there could be fewer difference-making waiver prospects emerging late in the season. Playoff format: One of the more likely rule changes is one that really wouldn't have too much of an effect on the Fantasy landscape. A 16-team playoff bracket that ignores conferences would have almost no tangible impact on Fantasy. Ditto for a "choose your matchup" format where the one-seed picks, then the two-seed, and so on down the line. While it's a fun idea, as long as the NBA doesn't change the methodology behind the construction of the regular season schedule, it wouldn't affect player value. NBA League Calendar: Multiple presenters indicated that there is significant internal support for switching the order of the NBA Draft and Free Agency (the draft currently comes first). Such a change would impact the CBA, and therefore would be highly unlikely to occur until 2023 or 2024. The biggest fantasy impact here would be in keeper or dynasty formats. Smart teams – which are frequently the ones drafting outside the top-10 – would probably get better at putting borderline role players and projects into better situations. In dynasty leagues with rookie drafts, mid-round picks would likely become a lot more valuable. End of games:The Elam Ending. By far my favorite proposed rule change, the NBA is (sadly) pretty far from serious about switching to the Elam Ending. The linked Zach Lowe piece does a great job explaining the logic behind the rule and why it's awesome, but other, shorter explanations are easy to find. The Elam Ending would be a boon to Fantasy, as it would finally present us with good options for a ninth category (Long-Live 8-cat! Down With Turnovers!). With this change, every single game would conclude on a game-ending made basket. Game-winning shots would become a new category with drastic impacts on both season-long and DFS. In all formats, there would be a new downside to rostering multiple people from the same team. In DFS, contests would hinge on the final basket, which would probably carry a points bonus. Number of Games: I find it highly unlikely that the NBA will shorten its regular season – as evidenced by the decision to rank this below the long-shot Elam Ending on the probability scale. But if it happened, the impact on fantasy would be huge. The biggest changes would be health and injury-related, and I went into more detail on that above. 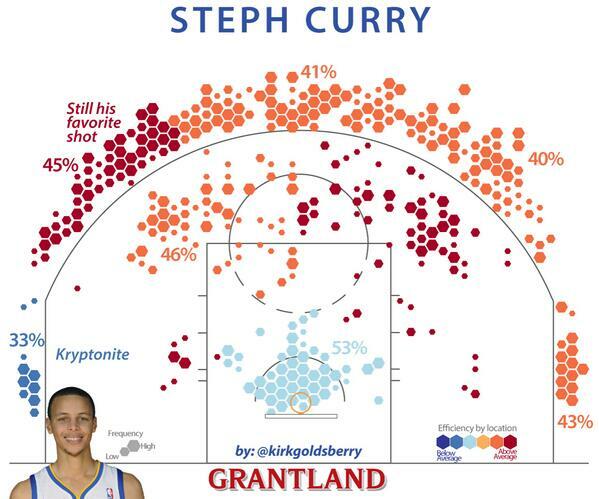 Home court advantage:Kirk Goldsberry is somewhat of a heroic figure at Sloan. He was the creator of the visualized shot charts that have become so popular. He is also a VP for the Spurs, and so his ideas are at least heard, even they are ignored. He's proposed allowing each team to set its own three-point line in its home arena – just as there is no standard distance of a home run in baseball. There was no indication that the idea is going anywhere, but it's fascinating to think about. The fantasy impact would be tremendous – and heavily dependent on what lines each teams establish. It's easy to find criticisms of the Sloan Conference. Most commonly, they center around the idea that it has moved away from its initial intentions and become more of a typical business conference. I frequently heard attendees say variations of "the real work happens in the hallways/happy hours/etc." They complain that the panelists hold back due to the competitive sports marketplace, and that the research paper presentations frequently spend too much time reviewing their process and not enough time explaining their findings. All of these critiques are fair, to a point. It has become an industry conference. The research behind the paper presentations were impressive and fascinating, but for many of them, the presentation quality lived up to the stereotype of an engineering college. If you are looking for a job in sports, especially a job in the numbers side of the business, then this is a great event to attend. Meanwhile, panelists definitely do hold back on stage – both for reasons of competitiveness and for professionalism. One panelist I spoke to acknowledged this outright. I asked him a question that he had hedged and avoided minutes earlier on stage, and he began his response with "it's OK, I'm not up there anymore, I can answer that." But the criticism goes much too far. Many of the research papers were not just interesting, but have the potential to drastically impact future shifts in how NBA teams play or prepare. Sure, sometimes the font was comically small on the slides, but every presenter I asked was willing to email their slides afterwards – and every presenter began and ended by sharing their contact info. Maybe the presentation spent too much on the process, but does that really matter if the findings should change the way NBA teams think about the shot selection? The panelists weren't giving away any trade secrets, but the panels gave good snapshots of the overall stat of the industry on a range of key topics – from injury prevention, to the impact of legalized betting, to the impact of analytics on a league-wide scale. Those hoping for an amphitheater full of nerds sharing freely while they waxing poetic on logarithms may be a decade too late. But the analytics-based focus of Sloan remains. Those who choose to attend all have a baseline understanding and acceptance of stats, numbers, and the scientific method. The presentations are worthwhile, and – sorry to be sounds corny – the conversations they inspire are the most important takeaway of all.